Le Roy & Fils, Paris. Serial # 10,999. 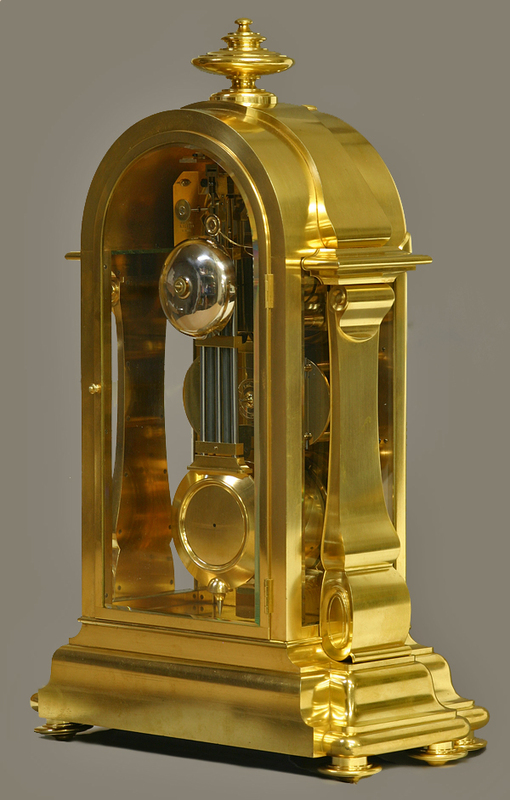 The large decorative round top gilt-bronze case has decorative columns to the sides, a shaped molded base with rounded corners, beveled glasses to four sides and back and a large finial above. 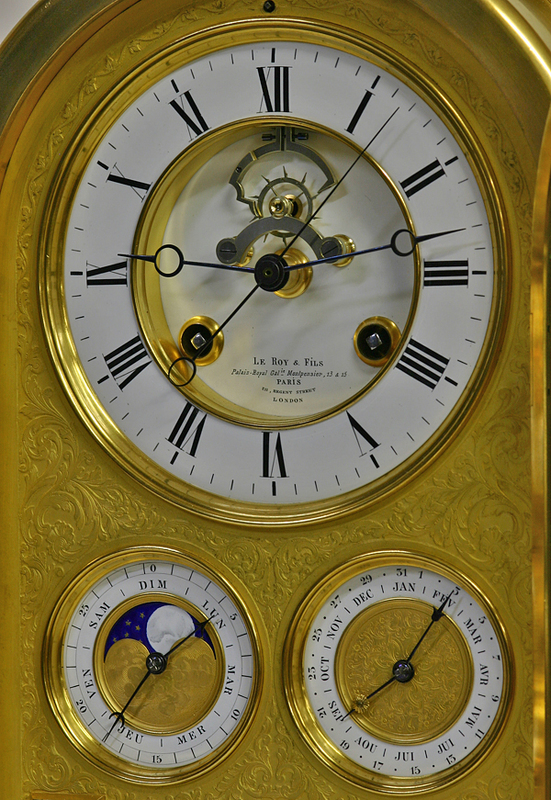 The white porcelain hour’s dial has a sunken center, Roman numerals for the hours, steel-cut Breguet-style hands including a center sweep second, an outside escapement and is signed ‘Le Roy & Fils, Palais-Royal Gal ie Montpensier 13 & 15, Paris, 211 Regent Street, London’. 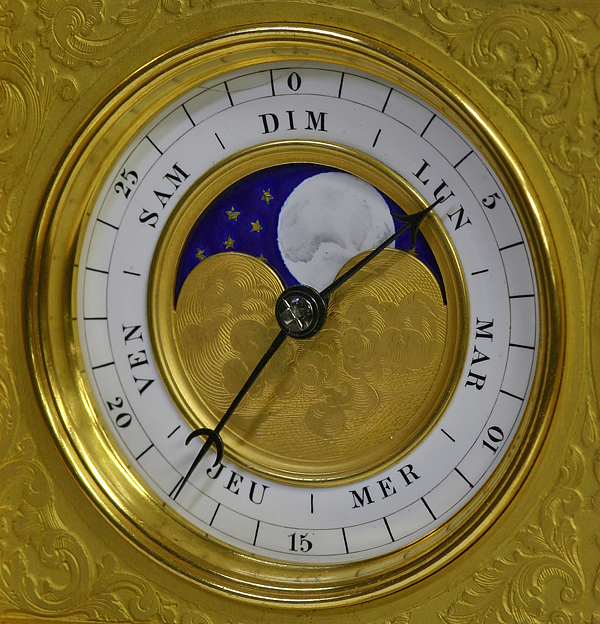 The two subsidiary dials in the center show the day, date, month. day of the lunar cycle and the phases of the moon by an enameled disc behind a shaped aperture. Centered below is a barometer that is flanked by two thermometers. All are framed by a gilt mask with engraved scrolling foliage on a chased and recessed ground. 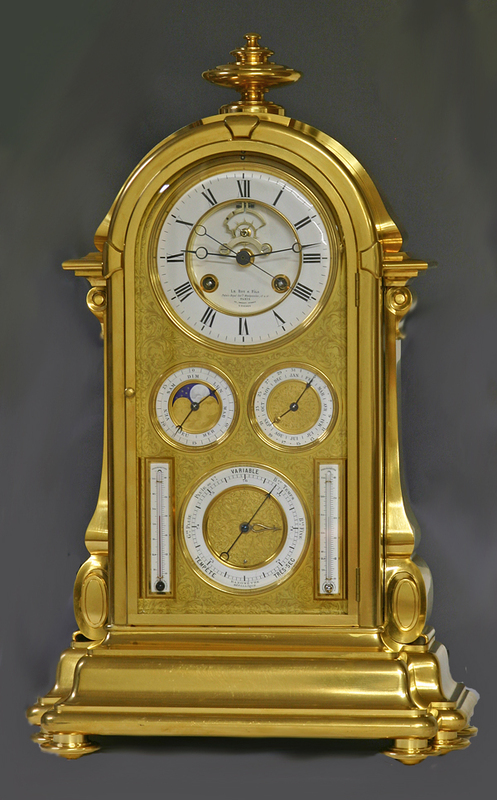 The large eight-day time and strike movement has square plates, is stamped ‘Le Roy & Fils, N. 10999, Paris’, is set for time off the backplate, has finely executed wheelwork, a constant force coup-perdu escapement, and a grid-iron pendulum with steel and zinc rods suspended by a steel suspension that is adjusted for fast slow out the dial. 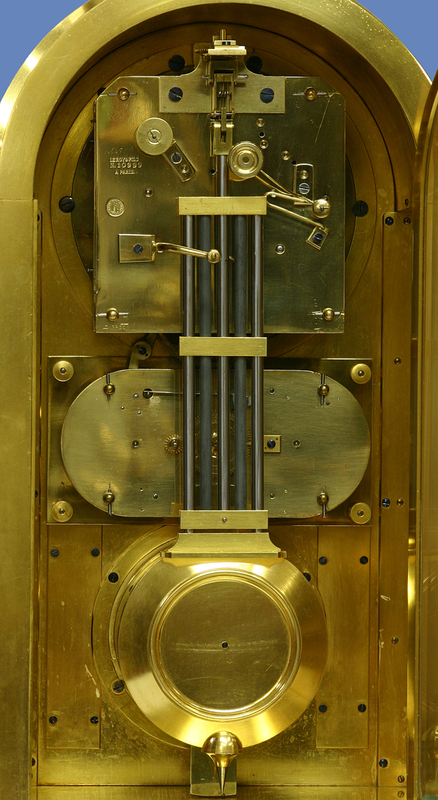 The pendulum is also stamped with the serial number ‘10,999’. Below is the perpetual calendar mechanism that has rectangular plates with rounded corners and the four year wheel on the back plate. 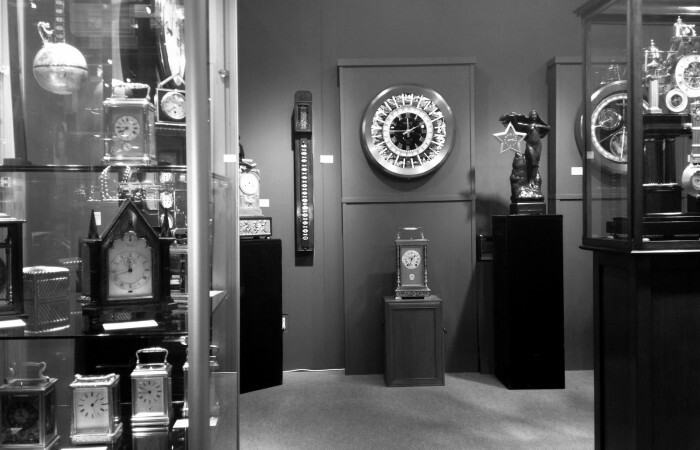 This particular design was particular to LeRoy & Fils clocks. 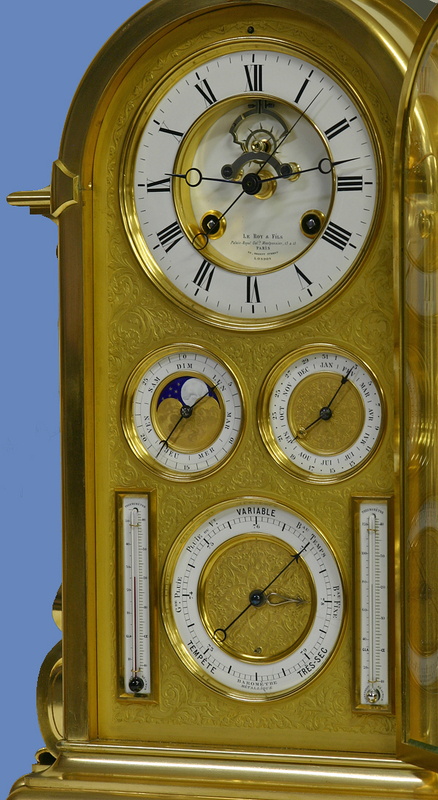 The escapement was developed by Desfontaines in about 1853. It allowed constant force to the train and also allowed the second hand to beat seconds with a half-second pendulum. The pallets are jeweled as is the pivot for the center seconds shaft. The high quality rise/fall mechanism is a unique design and allows minute adjustments from the dial. Unlike a Brocot suspension where the suspension spring is stationary, in this design the steel spring is raised and lowered against two polished steel posts. Desfontaines bought the business from Le Roy in 1845 with the understanding he would continue to trade under the firm’s name. This continued until 1889 when the business changed the name to Le Roy & Cie when he went into business with another Le Roy. The firm was at the address 211 Regent Street from 1866-1875. 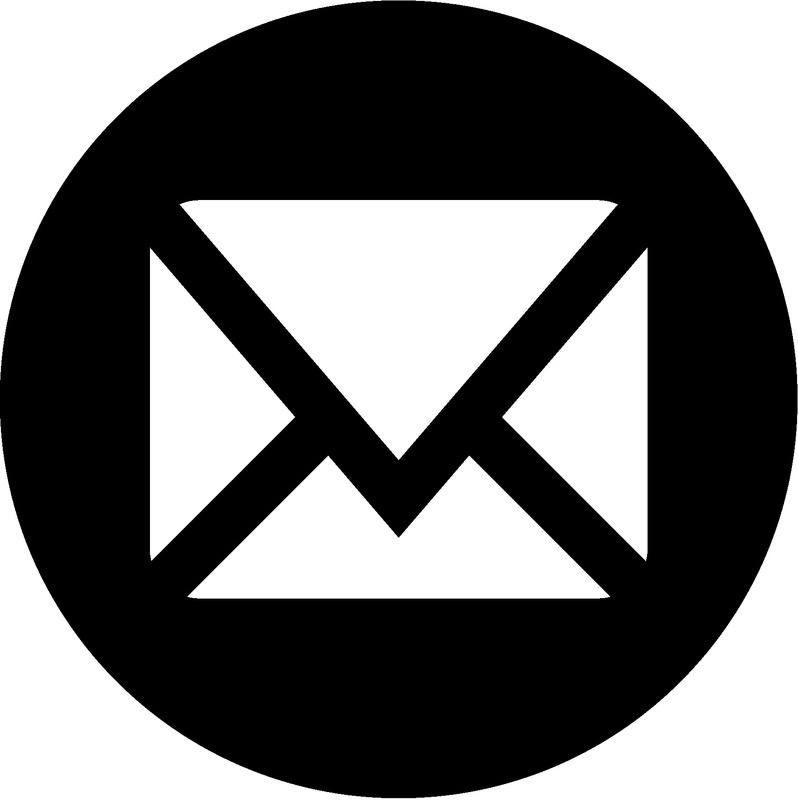 Although most grid-iron pendulums are steel and brass, some makers decided to use zinc and steel because the coefficient of expansion of zinc is both predictable and very responsive to temperature changes. ‘The Price Guide to Collectible Clocks’ by the Shentons, pg.298.